Summary: In his most ambitious work yet, New York Times bestseller James Lee Burke tells a classic American story through one man's unforgettable life—connecting a fateful encounter with Bonnie and Clyde to heroic acts at the Battle of the Bulge and finally to the high-stakes gambles and cutthroat players who ushered in the dawn of the American oil industry. In 1934, sixteen-year-old Weldon Avery Holland happens upon infamous criminals Bonnie Parker and Clyde Barrow after one of their notorious armed robberies. A confrontation with the outlaws ends with Weldon firing a gun and being unsure whether it hit its mark. In just a few years’ time Weldon will spar with the jackals of the industry, rub shoulders with dangerous men, and win and lose fortunes twice over. But it is the prospect of losing his one true love that will spur his most reckless, courageous act yet—one that takes its inspiration from that encounter long ago with the outlaws of his youth. 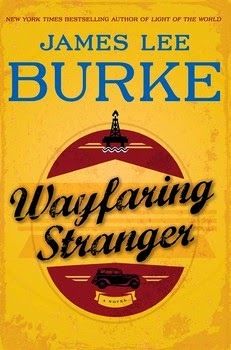 Author James Lee Burke begins WAYFARING STRANGER in the 1930s when 16 year old Weldon Holland and his grandfather, a legendary lawman, encounter Bonnie and Clyde hiding on their property. Even though he was smitten with Bonnie Parker, Weldon finds a reason to fire a shot into the back window of their stolen car as they drive off. This encounter has a lasting impression on Weldon’s life. The novel quickly moves to 1944 where Weldon, serving as an infantry lieutenant survives the Battle of the Bulge with Sergeant Hershel Pine and rescues Rosita Lowenstein from near death in an abandoned Nazi concentration camp. They fall in love and get married. After the war, Weldon and Rosita join Hershel and his wife, Linda Gail, in a business welding pipe in the booming Texas oil industry. Up to this point, the novel is a little sappy for my taste but because of Burke’s wonderful writing style I was drawn in to continue. I wasn’t disappointed. The characters are now beset with problems that include dangerous business rivals, the lure of Hollywood and anti-communist pursuers. Characters such as Roy Wiseheart, the son of an evil oil baron, his wife, Clara, a wealthy snob and anti-Semitic, unsavory insurance man, Lloyd Fincher and brutal police detective Hubert Timmons, make life miserable for Weldon and Rosita. They are exposed to blackmail, beatings, arrest and betrayal. Weldon’s Texas spirit, the love for his wife and an unusual tie to Bonnie and Clyde work together against the evils that have entered their lives. WAYFARING STRANGER can be loosely classified as a thriller but it is much more. It’s a love story. It’s a story of good versus evil and of loyalty and integrity versus wrongdoing. It’s also a journey through several historic events including the Bonnie and Clyde era, the Holocaust, World War II, 1950s Hollywood and the mid-20th century Texas oil boom. Somehow Burke was able to meld all these disconnected themes into a terrific cohesive novel. The authors character development and scene descriptions are the strengths of the novel along with a wonderful writing style that brings alive both the characters and the historic scenes. His use of Weldon as the narrator of the story also has a nice effect. Although not the type of book I would typically read, I thoroughly enjoyed WAYFARING STRANGER. Thanks to the publisher for providing a review copy of this novel and to Booking Pap Pap for his review. The fact that it's not Booking Pap Pap's usual fare and he still enjoyed it so much says a lot. I've never read Burke but my sister is a big fan of his.